We've all got a story, and every story matters. A couple of weeks ago, a dear friend of mine shared her story with me, and I was in tears, realizing where she had been, and so thankful for where God has led and is leading her! "I had no idea what to expect that day in January 2013 at some kind of women's conference. I had decided that I would just TRY this conference - no commitment, no mandatory follow-up, just this one January Saturday morning, and I was free to never go there again, or participate in any of their activities. This was all about ME, with no strings attached. I wasn't going to be suckered in by anyone or any church. At Intentionally & Wonderfully Made 2013, when Amy Lambert spoke of her drug addiction, and her recovery, I was captivated. As a recovering alcoholic, with twenty years of sobriety, I still had a demon that encourages me to have a drink. "Oh, I prayed to God," Amy said, "I prayed that I would die." Those words hit me square between the eyes, in my heart, and gave me chills all over. I had prayed that prayer, too often, but never as hard as I did the night I tried to end my life twenty years before. In 1993 I had lost everything that mattered: my job, my child, my 'Boyfriend,' all because of alcohol. I had no money, no hope, and no help. To me, Christmas was a joke. I thought my family would be better off not burdened by my problems and me. I just wished everyone would forget I had ever lived. On December 21, 1993, I shot myself in the chest and lost consciousness. Then I woke up. What? So I shot myself 2 more times, and lost consciousness again. I woke up again and thought, "Great. I can't even kill myself right. Not even God wants me now." I called for help, thinking I would be dead by the time they arrived. The next morning when I woke up in the hospital, I was angry that I was still here. I wished I had died. Reluctantly, I started the long, painful road to recovery. I never took a drink again. With my favorite therapist, starting with my earliest memory, we worked our way through my life. That was harder than anything I had ever done. I got a good job, and worked really hard to build myself back up. I was going to AA meetings. I was staying sober. My daughter decided she wanted to live with me again. Twenty years later, I still felt stuck. I had grown up in church, prayed when I needed to, and agreed with all the 'God' things people said, but I wasn't going to church and God was not an active part of my life. Now, almost two years since Intentionally & Wonderfully Made 2013, where I first heard Amy Lambert, met Sherry Jennings and Beverly Weeks, and became part of a local church, my life has dramatically - yet subtlety - changed. Jesus walks with me every day. 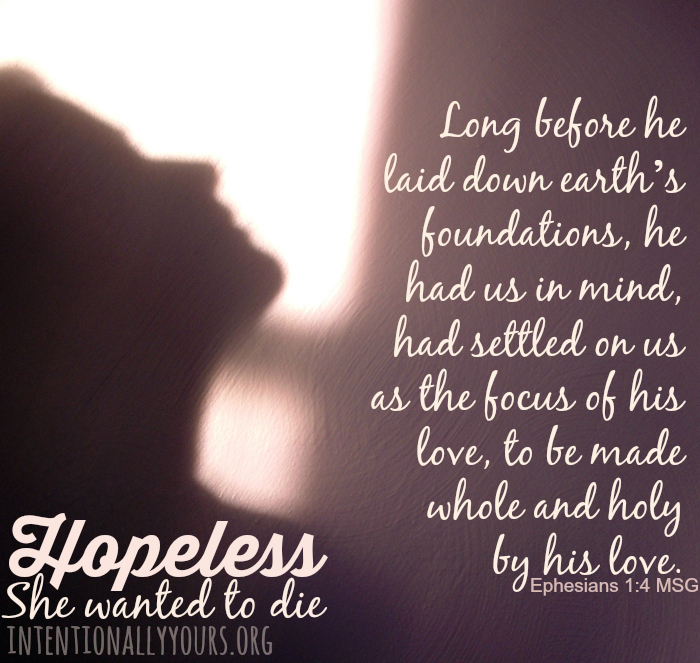 I know I am not hopeless or helpless. My life has more meaning, and I'm happier than I've been in many, many years. I am still single, but no longer desperate. If God's plan is for me to have another man in my life, it will happen in God's time, and I no longer worry about that. I am truly enjoying building relationships with other people - REAL friendships, through Jesus, friendships. Oh, sure, I still have problems. The big difference is that I am not doing it alone. God is with me, and my friends at my church are there, too, always ready to love on me when I need it most. I still don't drink alcohol. And I seldom wish I was dead, anymore. If there is anyone out there who wonders if a Saturday morning in January is worth their time and trouble to attend a women's conference, I have to ask them if they can afford NOT to attend. As women, we truly are 'Intentionally and Wonderfully Made,' and I'm so glad I learned that. It's truly amazing to take that first step, and watch God take the next one!" After attending Intentionally & Wonderfully Made 2013, this woman sought out and became part of a local church, joined a life group and got out of the abusive relationship with her boyfriend. What an incredible reflection of what God will do when we step out in faith with Him! "Intentionally & Wonderfully Made 2013 changed my life!!! I started praying dangerous prayers, believing that God would use to expand His kingdom what the enemy intended for evil. I believed that no matter how low someone can be, God is still working behind the scenes. Mother's and grandmother's prayers are heard by God and answered in mind blowing ways! I'm excited for IWM 2015!!!" "You will love it! What a celebration of being beautiful strong women of God and a hilarious time. Lots of vendors to shop and door prizes, too! When I went 2 years ago, there was over 1,000 women there. It was life changing for me, not too long after (the event), God started working on me and my husband." We are in AWE of the presence of God. The prayer team met Friday morning to pray for each of you!! We prayed specifically for Facebook needs, for those who have already registered for the event, for the vendors, and for those who have not yet purchased their tickets!!!! 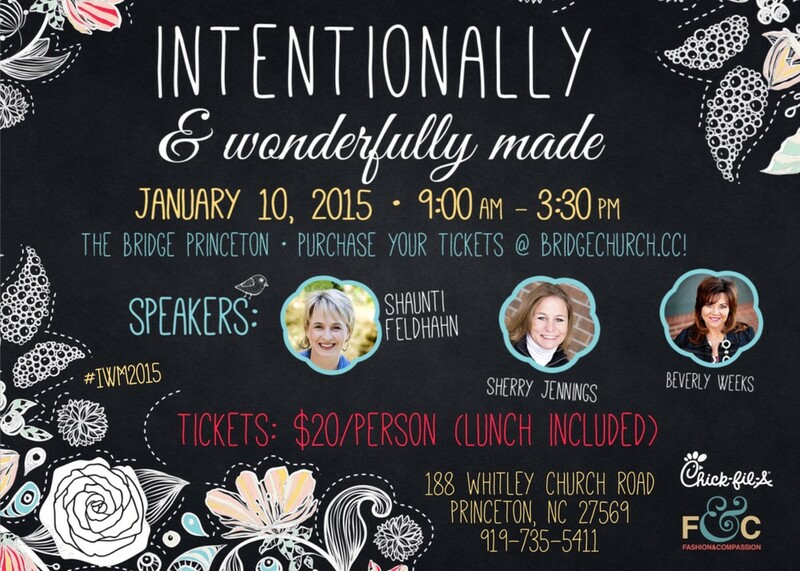 We are expecting GOD to do amazing things in the lives and hearts of women at Intentionally & Wonderfully Made 2015. We began to praise God for restored homes, marriages, prodigal children and spouses that are going to return home this year, for those of you needing a healing touch emotionally, physically and spiritually. My heart was SO full, I just wanted to sing, yet I knew they would run me out of there. Get ready it's a NEW day!! In 2015 GOD is gonna do even greater things!! I hope you will join us for IWM2015! We encourage you to invite your friends to join you at Intentionally & Wonderfully Made 2015- purchase a ticket for them, and invite them to join you at church the following Sunday!! Purchase tickets online here now- sales end January 7! Tickets will NOT be sold at the door. God, Help Me I'm Scared!